Before you start building, you need to lay the foundation for growth: strength is the only true shortcut to size. Fusing old-school German volume training (a weightlifting staple) with innovative tabata protocols will maximise the flow of blood to your muscles for hyper-efficient results. Rest for two days before taking on the next session. Repeat the following four-move press-up circuit twice to force blood into your pecs, providing them with nutrients and improving your posture to iron out any imbalances. This circuit can be done almost anywhere. Get down into a press-up position with your hands placed so your fingers are pointing towards your toes. 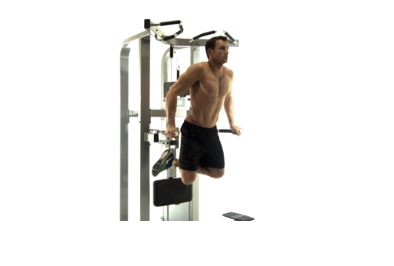 Lower your body until your chest is an inch from the ground then explosively drive up by fully extending your arms. Manipulating the fibrous tissues around your muscles can make or break your results. Your next gym workout allows for greater fascial stretching before hitting the pectoralis major (for depth) and minor (width) to boost expansion in all directions. Rest for two days before going back to session one. A bigger chest is 28 days away. While standing, place your hand behind you and push into your lower back. Pull your shoulders back and push your chest out. Return to the start position.